""One of our most original social thinkers,"" according to the New York Times, Robert Nisbet offers a new approach to sociology. He shows that sociology is indeed an art form, one that has a strong kinship with literature, painting, Romantic history, and philosophy in the nineteenth century, the age in which sociology came into full stature. Sociology as an Art Form is an introduction for the initiated and the uninitiated in so-ciology.Nisbet explains the degree to which sociology draws from the same creative impulses, themes and styles (rooted in history), and actual modes of representa-tion found in the arts. He shows how the founding sociologists such as Marx, Weber, Durkheim, and Simmel constructed portraits (of the bourgeois, the worker, and the intellectual) and landscapes (of the masses, the poor, the factory system), all reflecting and contribut-ing to identical portraits and landscapes found in the literature and art of the period. 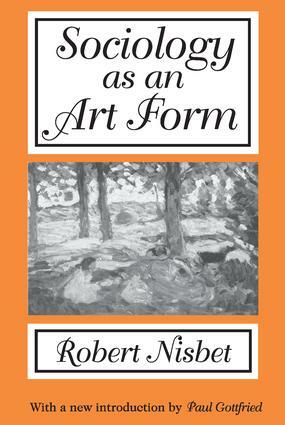 In addition to marking the similarities between sociologists' and artists' efforts to depict motion or movement, Nisbet emphasizes the relation of sociology to the fin de siecle in art and literature, with examples such as alienation, anomie, and degeneration. He creates an elegant, brilliantly reasoned appraisal of sociology's contribution to modern culture.This book will be of interest to sociologists, artists, and anyone interested in how the fields relate to one another.